The dead ghost of Annie Blackburn speaks these words to Laura Palmer in Twin Peaks: Fire Walk With Me, an apparition divining the future, for Special Agent Dale Cooper wouldn’t be stuck in the Black Lodge until well after Laura’s death. (More specifically, the final episode of Twin Peaks Season 2, in 1991.) And so as we dive into David Lynch and Mark Frost’s reboot of the iconic series, it is both thrilling and confounding to be submerged in a mystery that’s languished for 25 years, one that many have spent decades pursuing. It makes all the time spent looking for Lost easter eggs on made-up websites seem kind of remedial. In the phenomenally casted Twin Peaks reboot, whose first two episodes aired Sunday night on Showtime, we are reintroduced to Good Dale’s fate: he’s been missing for 25 years, and the greasy-haired Bad Dale (both played by Kyle MacLachlan), his evil doppleganger, is busy living on earth wreaking havoc in a snakeskin button-down. As it introduced new characters and dilemmas in its typical, seemingly disjointed vignette fashion, it became clear that everything now revolves in Good Dale’s fate, which becomes increasingly bleak as the episode roils on. In The Red Room, he speaks with Laura Palmer—serene and clothed in a velvet gown like a ’40s movie star—and MIKE, though it’s unclear if the former is her good self or her bad self. Laura whispers something into Good Dale’s ear and immediately becomes subsumed by her surroundings in a rather terrifying flurry of static; did she finally ascend to The White Lodge, or was she transferred to yet another place? We receive a clue later on, after MIKE reintroduces Good Dale to The Arm, who has apparently “evolved” from his original form (a man, played by Michael J. Anderson in past series) into what looks like a chewed-up wad of watermelon Bubblicious stuck atop an electrified silver tree, like a Christmas angel imagined by an ornery nine-year-old. 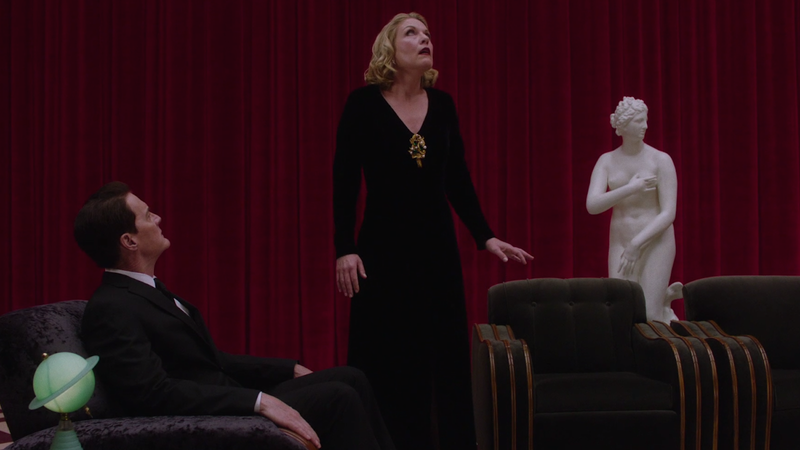 The Arm has a doppleganger, too—the Red Room is somewhere between the White Lodge and the Black Lodge, a well-decorated purgatorial lobby acting as passageway to what is most simply, but maybe not exactly accurately, described as Lynch’s interpretation of Heaven and Hell. The Arm’s evil doppleganger, who is also a bubblegum tree but maybe the flavor is banana, banishes Good Dale to nothingness, at which point he ends up in, oh yeah, a billionaire’s glass box in New York City being monitored for aberrant activity by a cute college student who really would rather just make out with the barista from the café around the corner. It’s an impulse that comes at the ultimate price. Does this make any sense to you? Having watched the two episodes once, and having a decent grasp on the Twin Peaks mythology, it actually does, to me—but the most enduring part about these first two episodes is that I think they also work as a standalone series for anyone new to the series who just wants to immerse themselves in the peculiarity. Lynch’s historical touchstones are so thorough and such a pleasure to watch—his off-kilter and extremely violent vision of the singular culture propagated in small town America is still heavily shaded by his love for classic noir, and so among the strangeness is the start of yet another classic gumshoe mystery that is both parallel and perpendicular to Dale Cooper’s spiritual battle. Only now we’ll be asking “Who killed Ruth Davenport?”—the librarian who ends up decapitated in her own apartment. One especially memorable scene, in which her murder suspect engages in a clipped argument with his wife, is so perfectly dramatic it recalls Who’s Afraid of Virginia Woolf? Which, of course, also makes it utterly hilarious: Lynch’s gruesome humor is on full display all over the place, and so if you find yourself laughing when someone gets murdered, chalk it up to the game. 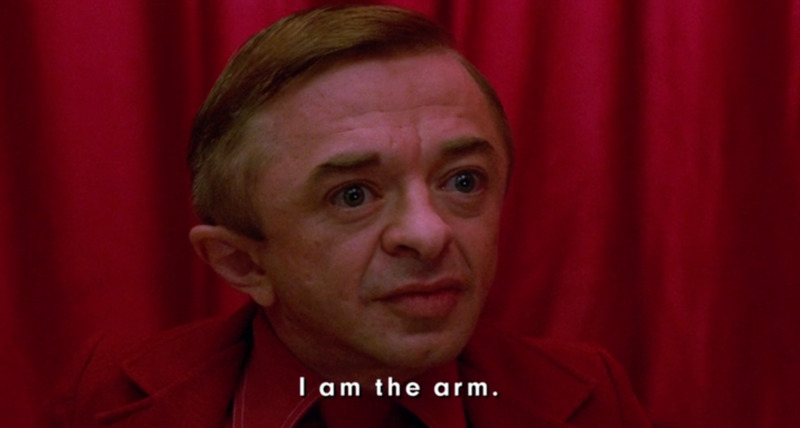 Twin Peaks purists may end up hating this incarnation of the series, and sure there’s a lot of killjoys to be wary of—namely, the sullying of memories, the potential resolution of its mysteries, and also the bad special effects (I CANNOT GET OVER THE ARM). But its first two hours were adventuresome and fun, and certainly as freaky as just about anything else on television right now. (Also, still easier to follow than The Leftovers.) I can’t wait for next week.